While some races are a thrill races, others (such as the 2014 Coke Zero 400) feel more like a family car trip from Southern Oregon to Southern California. You know the one…are we there yet? The interminable endurance test parallels the career of one Aric Almirola. My first memory of “The Cuban Missile” came from a Nationwide Series race at the Milwaukee Mile in 2007. Almirola goes out and wins the pole, gets the car to the front, but because of a sponsorhip commitment, the car’s regular driver- Denny Hamlin- finishes the race. The Floridian got credit for the win, but he wasn’t even at the track for the celebration. Talk about a hollow victory. 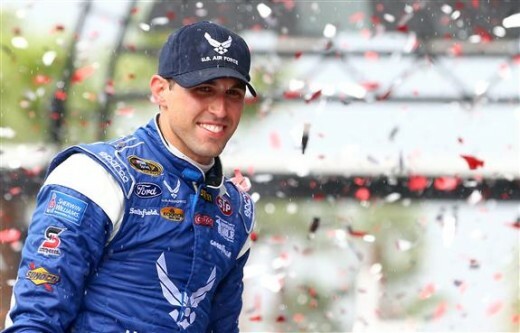 Though he’s had success in the truck series, and did decently racing for JR Motorsports in the Nationwide Series it seems like Aric Almirola has been on the verge of success his entire career. Sunday, he finally found victory lane at Daytona. The win has a significance on several different levels. 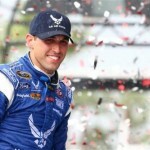 Almirola also has the distinction of piloting the famed 43 car to its first victory since 1999. The win also comes 30 years after the most famous of the 43 drivers- none other than Petty himself- got his 200th and final career win with President Ronald Reagan on hand to salute The King. Weird to think Almirola was 112 days old at the time. What is even more ironic is he is the 43rd driver to drive the 43 car, lineage that includes Petty, John Andretti, Bobby Hamilton, AJ Allmendinger and Bobby Labonte just to name a few. 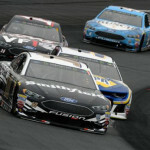 It may seem like a hollow victory for Almirola, but think again of all the good cars he has run that have been wiped out in someone else’s mess, or the all the times he raced in less than competitive rides just to stay out there. From this perspective, this victory rights a lot of racing wrongs.